Uriel Liwerant was born and raised in the Gush Etzion community of Efrat. 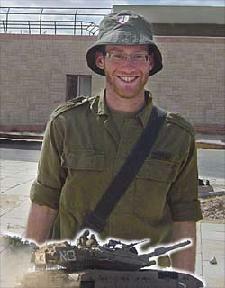 He was drafted into a Hesder unit of the tank corps after completing two years of Torah study at Yeshivat Har Etzion. He was soon promoted to the rank of tank commander. In early morning maneuvers on August 5, 2009, Uriel's tank made its way across a mobile bridge over a deep ditch. Uriel, feeling that the tank was not crossing straight, commanded his crew to brace themselves and to prepare for an overturn. Issuing these orders, he was able to save his soldiers but not himself. Uriel was thrown from the tank and was killed instantly at the age of 21. In their desire to pay tribute to Uriel's love for the land of Israel and for Gush Etzion in particular, the Liwerant family has joined forces with the Jewish National Fund to support the renovation of the Gush Etzion Heritage and Visitors Center. Located at Kibbutz Kfar Etzion, the Center is a memorial to the heroic defenders and settlers of Gush Etzion during the 1948 War of Independence. The JNF is currently amassing funds for a state of the art museum that will present and exhibit the history of this important era. Gracing the entrance way to the new museum will be a room dedicated especially in Uriel’s memory. The room will contain cutting edge interactive programs for allowing the visitors to learn and understand the role that the Gush Etzion area has played in the history of our people since time immemorial. Our patriarchs and their families walked these very hills and dales, literally paving the way for generations of our people throughout the millennia of Jewish history. This is the land where Uriel grew up, this is the land where he hiked for hours with his friends, this is the land where he was immersed in studying Jewish law and history, and this is the land where he always dreamed of connecting his nation’s past with his own future. In his name and in his honor, let us enable others like him to live his dream.